A day at the Country Races! BYO drinks, food and chairs! 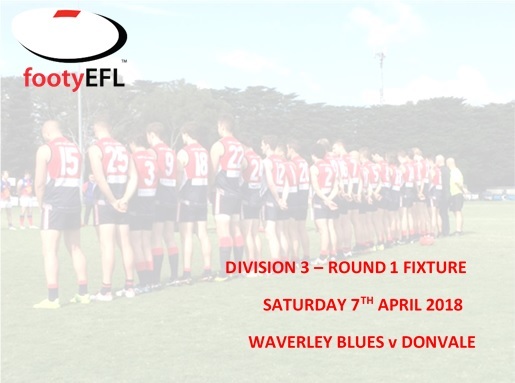 Come and join us on Saturday 7 April as we take on Donvale at home in our opening game of the 2018 season. Our players have been impressive at training under the guidance of our new coach Bryce McGain and we are anticipating a great season ahead! Back by popular demand and a two year absence, our Ladies Night is back! - Witness a new winner of the Ms Waverley Blues competition - a player revue by our Men's players. Who will take the mantle from reigning two time winner Luke Taunt!? - Ticket price includes beer, wine and soft drink from 730-1030pm and finger food throughout the night. Spirits at bar prices, with further drink specials on the night including Expresso Martinis! Everybody is being welcomed to take part in the Waverley Blues Football Netball Clubs trivia night 2017! Head down to the Club rooms after our home game against Croydon on the 20th May from 7:30pm onwards. You'll be in for a relaxed, fun, entertaining night, run by a professional Trivia master where tables of 10 will take each other on for the chance to share in some great prizes!! 🍻🥂🍺Feel free to bring down your own esky and nibbles platter to share with your table. Everybody is welcome - partners, mums, dads, cousins, friends, nannas - everyone! Book a table of 10 or we can organise you to jump onto another table. 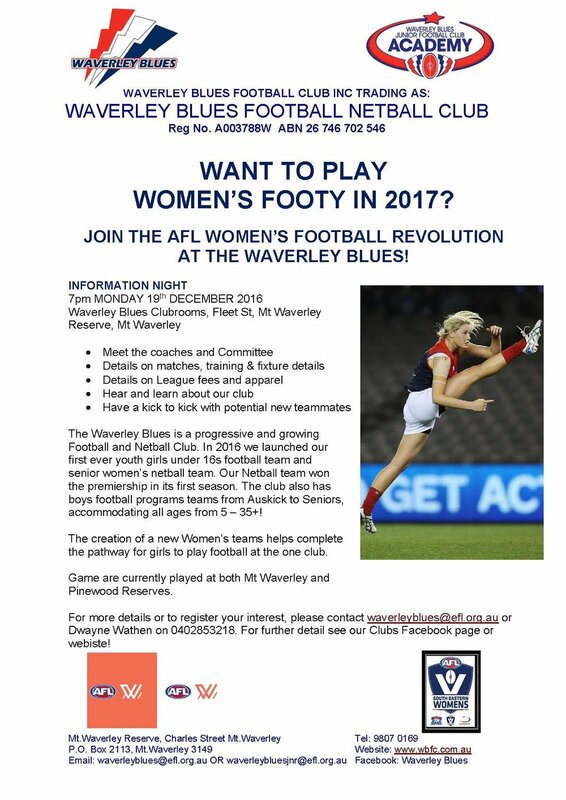 Waverley Blues are having a Cocktail Party on Saturday 6th May 2017 from 7:00pm to 11:30pm at the Mt Waverley Clubrooms. As this is the first parent function for the 2017 season we would love to see you all there and please feel free to invite friends. The cost includes two cocktails, finger food and a DJ so bring your dancing shoes. Please see the attached Cocktail Party Invitation. Another big home game is scheduled for this Saturday 29th April at Mt Waverley Reserve. This will be a historic day for the Club with the first ever official game for our Women's football team. Get down early to support the ladies! Our canteen, bar, BBQ and coffee van will be open all day, along with the oppurtunity to purchase club merchandise and memberships. For free entry make sure you show your Membership card at the gate. Get your tickets to opening round Mates Day online. Our third practice match for the year will be away against East Ringwood on Saturday 25th March 2017 for the U19s, Reserves and Seniors. 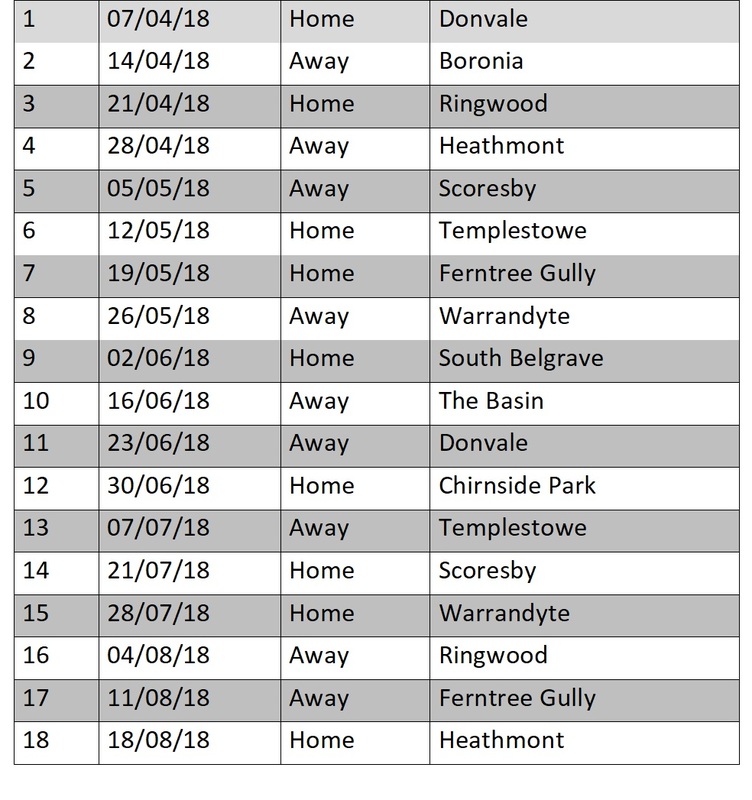 East Ringwood are now a traditional pre-season warm up game for both Clubs, with East Ringwood still in Division 1 of the EFL. Our second practice match for the year will be away against the Morwell Tigers on Saturday 25th March 2017 for the U19s, Reserves and Seniors. We played Morwell two years ago at their ground in what was a great hit out for our side on a big ground used for AFL pre-season games. PAYMENT: EFT Preferred to Club bank account. Players and parents can register for the 2017 season, purchase and order apparel and meet the Committee and Coaches. This year we welcome all Junior players - from under 9s to under 17s (boys and girls) to participate in the warm up and skills session with the Senior Playing Group and Senior Coach Ben Carboni. Training starts 6pm SHARP and is expected to last 30-45 minutes for the Juniors. Players and Parents are then welcome to watch training during registration night. A free BBQ and drink will be available on the night too! Our annual pre-season camp will be held again at Phillip Island for all Senior and U19s players. It will be a great opportunity to work on our fitness and team bonding ahead of the 2017 season. Includes: Finger-food, beer, wine, champagne & soft drink from 1-4pm. Choose a song and be in the running to win $750 and more! DJ Entertainment, finger food & drink specials all night! Includes lunch, drinks, prizes and entertainment! More details about tickets and the day to come!